Ensete ventricosum ‘Maurelii’ is a native to Ethiopia and is popular due to its red color on the trunk, stems, and underside of leaves. This Banana is strickly ornamental meaning use it for its looks not for the fruit, great for creating a quick tropical look. ‘Maurelii’ can reach 12-15′ tall in warmer climates. In cooler climates the growing season will not be long enough to reach that size and this plant will need protection in the winter at temperatures below 20°F, making it a good choice for a container plant. This variety was named after J. Maurel who brought the plant to the attention of French Authorities in Ethiopia. 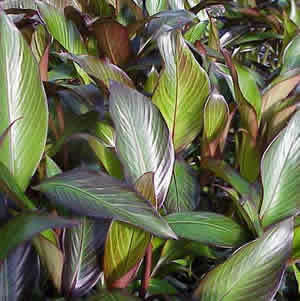 Ensete ventricosum ‘Maurelii’ is grown by tissue culture but not very easily which is why it is in short supply.